A salvage pathway is a pathway in which nucleotides (purine and pyrimidine) are synthesized from intermediates in the degradative pathway for nucleotides. 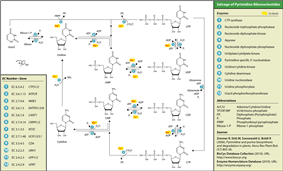 Salvage pathways are used to recover de novo synthesis. The salvaged bases and nucleosides can then be converted back into nucleotides. Uridine phosphorylase or pyrimidine-nucleoside phosphorylase adds ribose 1-phosphate to the free base uracil, forming uridine. Uridine kinase (aka uridine–cytidine kinase) can then phosphorylate this nucleoside into uridine monophosphate (UMP). UMP/CMP kinase () can phosphorylate UMP into uridine diphosphate, which nucleoside diphosphate kinase can phosphorylate into uridine triphosphate. Thymidine phosphorylase or pyrimidine-nucleoside phosphorylase adds 2-deoxy-alpha-D-ribose 1-phosphate to thymine, forming thymidine. Thymidine kinase can then phosphorylate this compound into thymidine monophosphate (TMP). Thymidylate kinase can phosphorylate TMP into thymidine diphosphate, which nucleoside diphosphate kinase can phosphorylate into thymidine triphosphate. The nucleosides cytidine and deoxycytidine can be salvaged along the uracil pathway by cytidine deaminase, which converts them to uridine and deoxyuridine, respectively. Alternatively, uridine–cytidine kinase can phosphorylate them into cytidine monophosphate (CMP) or deoxycytidine monophosphate (dCMP). UMP/CMP kinase can phosphorylate (d)CMP into cytidine diphosphate or deoxycytidine diphosphate, which nucleoside diphosphate kinase can phosphorylate into cytidine triphosphate or deoxycytidine triphosphate. The salvage of pyrimidine ribonucleotides. Phosphoribosyltransferases add activated ribose-5-phosphate (Phosphoribosyl pyrophosphate, PRPP) to bases, creating nucleotide monophosphates. There are two types of phosphoribosyltransferases: adenine phosphoribosyltransferase (APRT) and hypoxanthine-guanine phosphoribosyltransferase (HGPRT). Lesch-Nyhan syndrome is associated with a deficiency of HGPRT.